More than a year ago, my friend was engaged (now married) decided that she and I were going to make jam for her wedding favors. Neither of us had ever made jam, nor did we know where to start. It just happened to be around the time my cousin started her wonderful blog sharing traditional skills. She gave me a simple recipe with advice based on her own experiences. 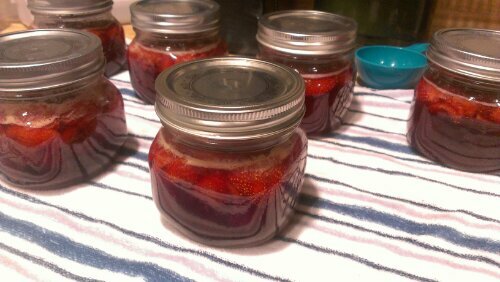 Then my friend decided we would do cupcakes in jars instead. 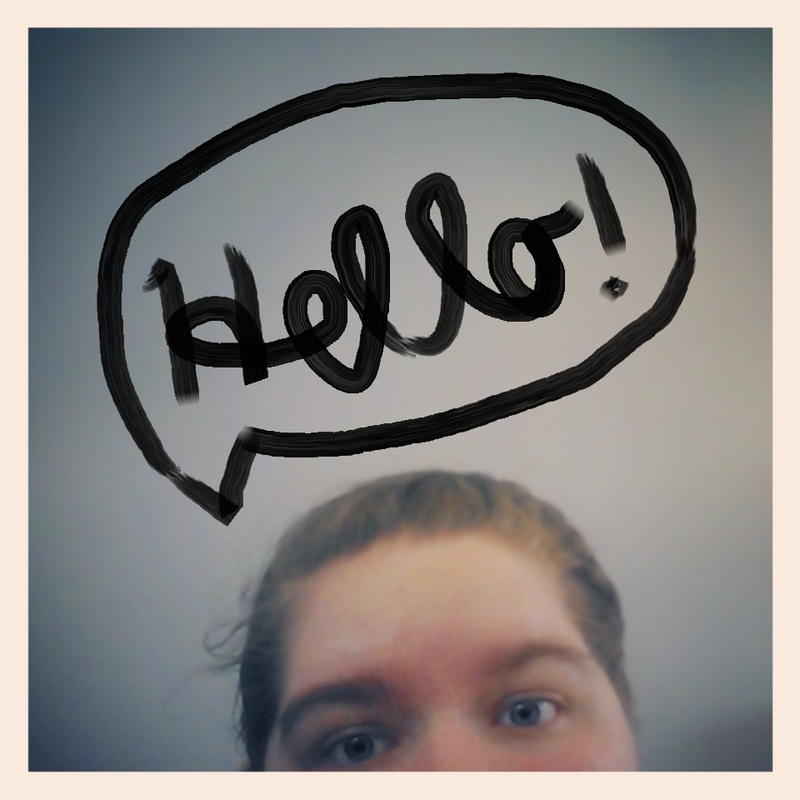 Sooooo…..I kind of put canning out of my mind. Until yesterday. I just woke up and decided, “Today is the day!” I went out and scooped up a few supplies. Then I just followed my cousin’s simple instructions. 01. 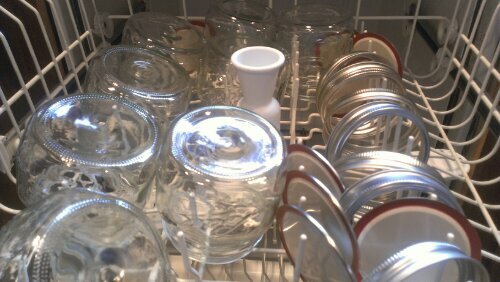 Sanitize jars, lids and rings in the dishwasher. Keep the dishwasher closed until it’s time to fill so they stay warm. Otherwise the hot jam will cause the cold jar to crack. 02. Combine all ingredients in a large pot and bring to a boil over medium heat. Stir frequently until sugar is dissolved. Keep stirring regularly until mixture thickens. This could take up to an hour. 03. 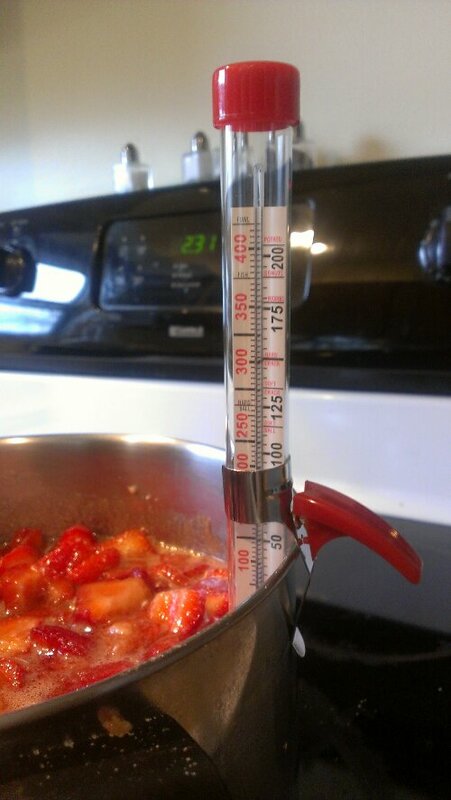 Using a candy thermometer, watch the mixture until it reaches 220 F. Keep heat on medium, it’ll get there. 04. Fill jars to below the threads. One recipe I found said 1/4 in below. 05. Wipe the rims of the jars clean with a damp towel, and place the warm lids and rings on snugly. 06. Bring water to a boil in a water bath canner or large stock pot. 07. Once boiling, place jars on rack in the water canner or on kitchen towels (make sure these are level) with a jar holder so the jars are not touching each other with the water level about 2 in. above the tops of the jars. 08. Bring water back to a boil. 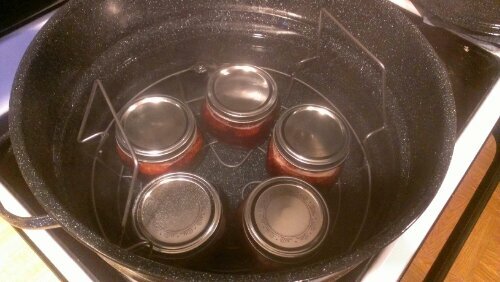 Once the water is boiling again, leave jars for as long as the recipe instructs (mine said 10 mins, it varies depending on your elevation). 09. My cousin suggests turning the heat off and taking the lid off the pot and leaving the jars for 5-10 mins before removing them to avoid the jam rushing out of the jars. Gotta love life experience. 10. Let the jars cool completely somewhere without a draft. 11. Do NOT press the lids down. 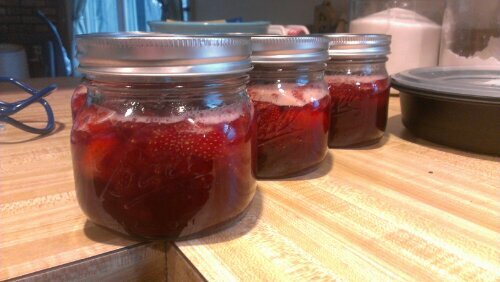 While they are cooling, you will hear little pings when the cool jam pulls the lid down, thus sealing the jar. I bought a water bath canning kit, which ran me about $25. 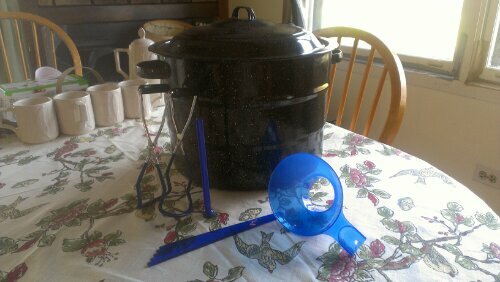 It came with the pot, rack, funnel, rim cleaner (dirrty), jar grabber, and magnetic lid picker upper. These are all technical terms I made up because walking to the recycle bin is too much work. My grocery store and some big box stores carry a pretty good selection of canning supplies. For something that doesn’t require a huge start-up cost, I’m surprised more people don’t do this. Canning isn’t limited to jams. You can make your own pasta sauce, pickles, pie fillings. Basically anything you can find in a can can be canned (lo siento if that was confusing). Please do not think this was all sunshine and roses. I did it right…sorta. When I finished the jam and it had cooled it was very runny. In my disappointment, I posted a status on Facebook about how I had failed at jam and my cousin told me that this recipe isn’t supposed to set like I was expecting. Basically I just have to cook it down to a thicker consistency. She told me this after I had already reprocessed the jam with store-bought pectin. Which didn’t work like I expected either. Anyway, I’m lucky to have someone so knowledgeable who can explain to me how/what/why I did wrong (or sorta right) and she has some great tips. Seriously, check her blog out. Seriously inspirational. Seriously. 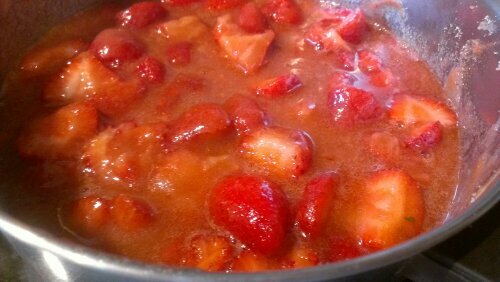 So tonight I’ll be cooking the jam down again. I might also try another flavor because I like to torture myself. Let’s talk about this new juicing trend. Yes, I watched Fat, Sick and Nearly Dead. I am a member of Join the Reboot. I own a juicer. All of these things happened months ago, nearly a year. Guess what? I never tried the cleanse until yesterday. My sister and I broke out my never used juicer and got to slicing, dicing and juicing. We got new bottles to hold a day’s worth of juice. We were all prepared. We prepped for the whole day the night before. We were feeling great! I woke yesterday feeling amazing. I was ready to begin my new life as a cleansed person. I knew it would be a tough three days, but I felt I could do it. (Who needs the one week of preparing your body? Not this girl) The breakfast juice was pretty good. I could do this. The midmorning juice was tolerable. Still in this. Then we decided that the combined $120 we spent on produce could not go to waste. We bought a stockpot and cooked up a modified version of the cleanse. I’m basically going vegan and I’m fairly certain she’s just going to do whatever the hell she wants. Ok, I shouldn’t be so hard on her. She did make us our breakfast juices today. It tastes pretty ok. The only thing I can’t say I love is the (for lack of a better term) gaminess of the produce. It tastes how that department in the grocery store smells and I’m not a fan. I’m considering stevia as a possible resolution. Lunch today is a meat and dairy free salad. A big one. A delicious one. Dinner is perhaps going to be soup made from our excessive amount of produce. I am a fledgling adult. I know this. At 23, I have no expectations for myself than to do my best to be open to learning. Being ambitious is a part of it. I know that some of you are in the same boat and some of you (bravo!) are ahead of me. I’m seriously jealous of you. I posted before about doing some Marathon Cooking, and I was pretty darn ambitious. Then I got sidetracked, and then I got sick. Life happens, I know, but I still got pretty down because not only did I want to share the experience but I wanted to know I could do it. So, like I mentioned here, I got to shopping. Problem is that I can’t find tomatillos. Que lastima. Also, for some ungodly reason, the second I walk into a grocery store I completely forget I need potatoes. WHY? Despite my difficulties in having a memory or specialty produce selection, I did a little baby half marathon cooking. One afternoon of cooking got me 3 meals. I’d say pretty good meals too. I went ahead and my the Andouille Sausage/Pinto Bean Stew and the Baked Penne with Chicken and Sun-Dried Tomatoes. The stew was delicious. So delicious in fact that I don’t have a picture because I was preoccupied cooking and it’s all gone now. The Penne was awesome (I used an insane amount of mushrooms in it-heaven) and the recipe is specifically written so you cook one and freeze one for later. Love it. So despite my Sunday falling short of the epic proportions (portion pun intended), I still consider it a success. We are still eating and I still get to go home and relax over a bowl of penne.